If completed, the skyscraper named Baobab would be largest wooden structure on the planet, rising above two other wooden buildings currently proposed for Stockholm and Vienna. The architect behind the wooden village is Michael Green, a designer who’s been an evangelical voice for wood’s revival. And he’s not alone. Thanks to incredible technological advances over the last decade, wood has become championed as stronger, safer, and more economical than steel. That’s because traditional wood beams are being replaced with prefabricated “mass timber,” where sheets of wood with alternating grain are laminated atop one another to make a super-strong building material. This makes wood a far better choice for building a structure: It not only requires much less energy to manufacture, it comes from a renewable source and can sequester carbon. And in many ways it’s more fire-resistant than steel because burning wood creates a layer of insulation in the form of char (much like how trees protect themselves in a forest fire) which is less likely to structurally fail under the same conditions. 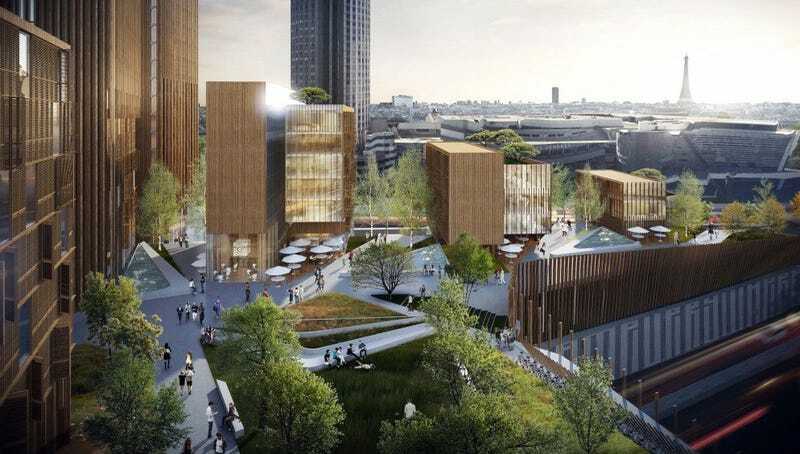 The Baobab plan is part of Reinventer Paris, a comprehensive redevelopment program for the city that is turning over 23 sites in the city to innovative urban projects. Pershing, the area which the wooden skyscrapers are proposed for, would be part of a larger eco-minded community with affordable housing, urban farming, and transportation connections. The development claims that the environmental benefits of using wood is the climate equivalent of taking 2,207 cars off the road. While Green’s idea still needs Parisian approval, it may not be the tallest wood building proposed for long. There’s been a $2 million push from the White House here in the US to develop more wood structures, and SOM, the architects behind the Willis Tower and many more of the world’s tallest (steel) buildings, have an idea for how to build a 42-story tower. When it comes to wood, things are certainly looking up.